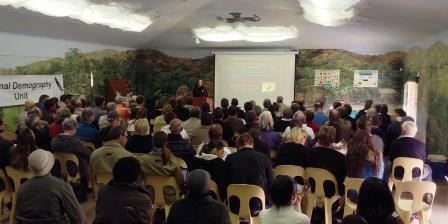 The ADU Citizen Scientist Day, held at Walter Sisulu National Botanical Gardens, Roodepoort, Johannesburg, was highly successful. Over 100 people attended and were entertained by a programme of talks giving feedback on most of the ADU projects. Weavers were mentioned in a general overview of the Virtual Museum projects and in a talk specifically about PHOWN (PHOtos of Weaver Nests). It did not take long for a few PHOWN records to appear from the Walter Sisulu National Botanical Gardens, taken by attendees on the day, after the talks. To see these, and previously submitted records from the gardens, see here.